Thanks to our intrepid Content Curator, Reilly Smith, LBRY’s beta release was a disaster. What I mean to say is we unleashed a disaster. 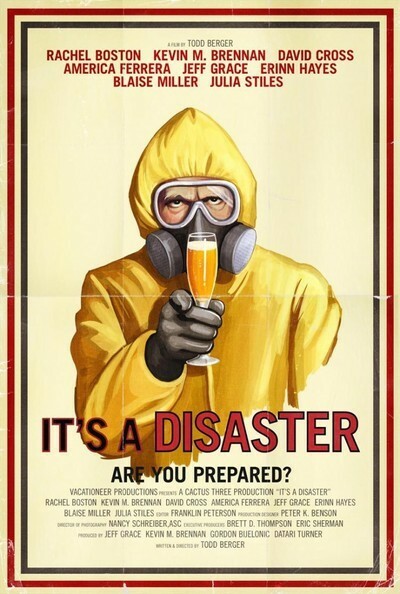 Ok, actually, we released the indie feature film It’s a Disaster, and the response was tremendous. The film grossed 1,900 LBC in the first two weeks after its release. That’s about $1,200 as of this writing. A good number of our beta users watched the movie. A groundbreaking content distribution platform is useless without great content. It’s a Disaster is among the best there is. The film stars David Cross (Arrested Development, Mr. Show), Julia Stiles (The Bourne Ultimatum, Dexter), and was produced by some of Hollywood’s brightest rising talent. The setting for this dark comedy is a regular Sunday brunch attended by four couples. The gathering is filled with the tension and awkwardness audiences have grown to love in Cross’ performances. The strained brunch goes even further off the rails when a deadly chemical attack occurs in the nearby city, apparently dooming the attendees to an unpleasant death. This is the first film for LBRY users from Oscilloscope Laboratories, one of the most respected indie film distribution companies in Hollywood. Oscilloscope was founded by the late Beastie Boy, Adam Yauch, aka MCA. Oscilloscope showed its penchant for forward-thinking by becoming one of the featured content partners for our July 4 launch. We’re excited about the possibility of adding additional O-scope films to LBRY down the road. If you are a LBRY beta user and haven’t watched It’s a Disaster yet, check it out. We think you’ll really enjoy the film. And the more people who watch and love It’s a Disaster, the more great movies LBRY will get in the future.